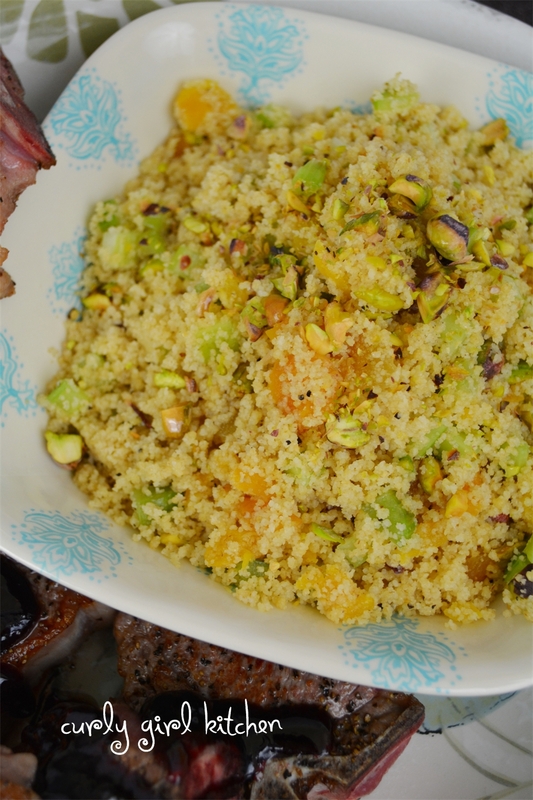 When I saw a recipe for couscous with pistachios and apricots on Simply Recipes, I knew it was something I wanted to try soon. 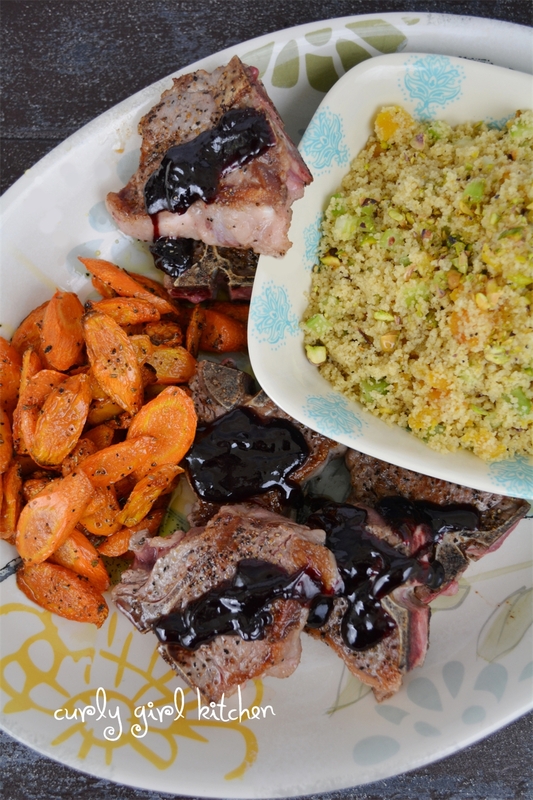 It also sounded like it would be really good with lamb, and since we haven't had lamb in a while, I thought a dinner of lamb chops, with the couscous and some roasted carrots would be perfect for a Friday night. Pistachios are something I use sparingly since they're so expensive, and paying $11 for a pound of roasted salted pistachios still in the shells seems excessive. So after shelling the whole bag, and eating a few, too, of course, I thought about how far I might be able to stretch them. Out of their shells, the pile of nuts seemed much smaller than they had looked in the bag, but I was sure that I could get at least three, or maybe even four recipes out of them. So that was my challenge to myself. The first, of course, was this couscous. 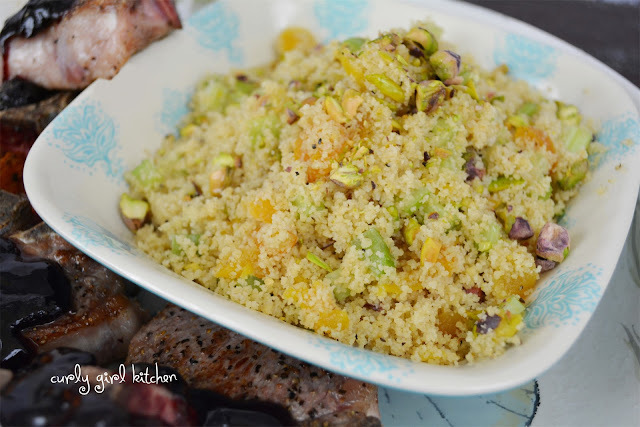 I varied the recipe a little from the original, and I really loved the crunch of the pistachios with the soft couscous and sweet dried apricots. I roasted the carrots in a little duck fat until they were tender, and the lamb needed nothing but some salt and pepper and a quick sear in a hot skillet. 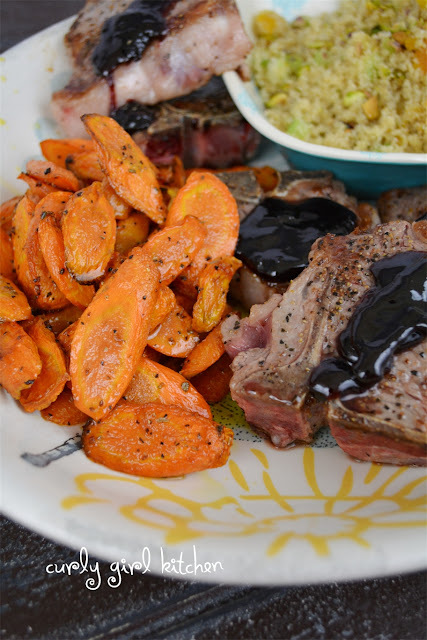 I topped the lamb with a spoonful of warm blackberry sauce. It was a warm and cozy dinner. Can you guess the other three ways I used the pistachios? Combine the chicken broth and couscous in a saucepan and bring to a boil. Remove from the heat, cover and let stand for 5 minutes. Fluff up the couscous with a fork, and stir in the celery, pistachios, apricots, lemon juice and butter. Season to taste with salt and pepper. Some sauteed onion in this would be great, too!